Bio Diesel (IS 15607 – 2005) is one of the best alternative fuels being produced nationally and globally. Owing to its properties, Bio Diesel has usage in a wide spectrum of applications across a number of industries. Moreover, because of the advantages Bio diesel has over conventional middle distillate hydrocarbon fuels, many companies are proactively harnessing the potential of Bio Diesel. The govt. is encouraging use of pollution free, renewable source of energy. 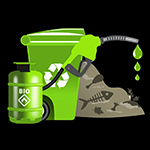 Biodiesel is an alternative fuel similar to conventional or ‘fossil’ diesel. Biodiesel can be produced from straight vegetable oil, animal oil/fats, tallow and waste cooking oil. 1. The country imports over 70% of its crude oil requirement which costs valuable foreign reserve. The entire world is trying to maximise use of alternate fuel. Bio-diesel gives perfect substitute for our country. 2. A mixture of Bio-Diesel (B 100) when used with different proportions of hydrocarbon-Diesel (HSD), makes it a perfect substitute for most of the applications where diesel is used exclusively. 3. It offers a distinct pricing advantage over diesel produced from crude oil. 4. There is no requirement for explosive license as it has a much higher flash point compared to diesel and thus allows for easier storage and safer handling. 5. There are no traces of sulphur found in our product which extends the life of catalytic convertors. 6. Besides being cheaper, the quantum of bio-diesel you use directly reduces the quantum of hydrocarbon diesel used so directly reducing GG emissions. 7. IS 15607 – 2005 when formed most of the OEM manufacturers were represented in the committee which decided on the specifications. 8. The refineries are gradually reducing the production and supply of LDO due to its unviable pricing. Hence, Bio–diesel in its impure form is now extensively being used as replacement for furnace oil and LDO. 9. Due to subsidy the govt. is gradually increasing the price of Kerosene and reducing the availability of kerosene in open market. The industrial kerosene is also priced closed to diesel. Bio-diesel in rural area and small towns have provided a replacement as Bio-kerosene. 13. Bio diesel does not come under Solvent Licence or Diesel control order.